LiDAR firms attract investments as corporate and venture investors vie for a piece of this burgeoning market. Big money is pouring into the LiDAR market, as carmakers gear up for autonomous and assisted driving. LiDAR, along with advanced computer vision and radar sensors, is an essential component for vehicles to maneuver without hitting obstacles or other cars. LiDAR is an acronym for light imaging, detection, and ranging, and until now it has been almost synonymous with next-generation automotive technology. But as R&D work continues, researchers are finding many more uses for this technology, setting off a funding race for a technology that many expect to become ubiquitous in the near future. 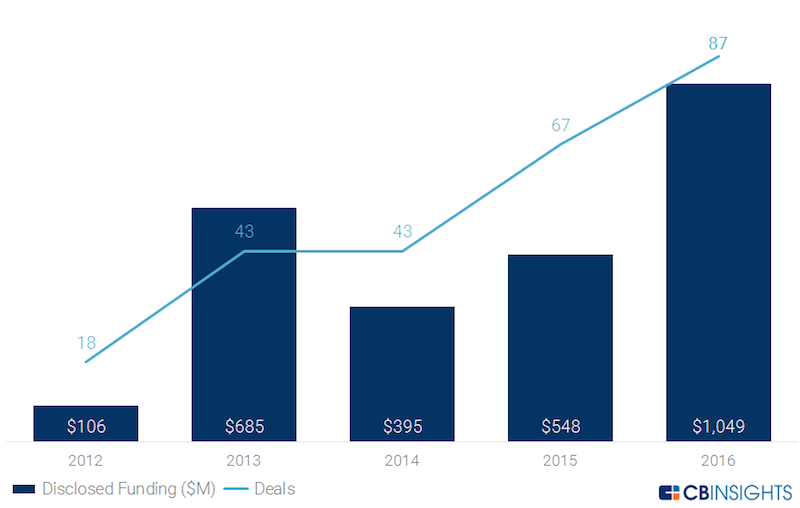 CB Insights estimates $1.049 billion was invested in automotive technology startups last year, involving 87 deals and representing a 91% increase in funding from 2015. LiDAR represents a growing portion of those investments. When Luminar Technologies emerged from stealth mode in April, it announced raising $36 million in seed-stage funding from Canvas Ventures, GVA Capital, and 1517 Fund (backed by Peter Thiel). Even more remarkable than that hefty figure, Luminar has been in development for five years, crafting a LiDAR system from scratch, and its CEO, Austin Russell, is just 22 years old. It seems that investors can’t get enough of this technology. Last year, Ford Motor and Baidu together invested $150 million in Velodyne, now one of the biggest entrants in the LiDAR race. And LiDAR technology is at the center of an ongoing legal battle between Uber Technologies and Waymo, the Alphabet/Google unit for self-driving cars. With all that is going on in Silicon Valley surrounding automotive electronics, it’s no wonder that Porsche Digital is setting up shop with an office in Santa Clara, where about 100 employees will work. “The car is the ultimate mobile device of the future, and the future is being written in Silicon Valley,” Thilo Koslowski, managing director of Porsche Digital, said in a statement. It’s not clear whether Porsche will pursue LiDAR technology in Silicon Valley. Still, the German maker of sports cars is following a long list of automotive manufacturers from around the world that are conducting research and development in the Valley. Louay Eldada, the CEO of Quanergy Systems, is not surprised to see all the attention and money flowing toward LiDAR R&D. His company, based in Sunnyvale, Calif., has attracted a total of $120 million in venture funding from the likes of Daimler, Delphi Automotive, Samsung Ventures, and Sensata Technologies. “It’s the most capable sensor that has not been adopted because it’s not ready commercially, really, because of the cost, and also the reliability in some cases,” he says about LiDAR. Regarding Quanergy, “we’re getting a lot of attention because we address these two points – reliability, by making the product completely solid-state, and the cost, by making it fully based on silicon CMOS processes at very low cost at your typical semiconductor fabs, like TSMC,” he adds. Most, if not all, LiDAR startups are fabless semiconductor companies, and rely upon TSMC and other foundries to produce their LiDAR sensor chips. “We do all the design in-house, and we outsource to semiconductor fab, through TSMC,” Eldada notes. Quanergy has a number of strategic investors. Samsung, one of its largest investors, is looking at LiDAR for smartphones, and in sensing technology for appliances and other products. Eldada has devoted 27 years to working on his company’s technology, since receiving his Ph.D. from Columbia University, he says. Quanergy was founded in 2012. LiDAR is beginning to fan out into other markets, as well. Cepton Technologies of San Jose, Calif., introduced its wide-angle LiDAR products at Nvidia’s GPU Technology Conference. Its LiDAR products are aimed at industrial applications as well as automotive. The company says its technology can detect objects more than 200 meters away. Cambou notes that the latest major investment from Ford and Baidu in Velodyne LiDAR, $150 million. Just before that, Continental purchased the automotive branch of ASC. Konica Minolta purchasing MOBOTIX is another noteworthy takeover in the security field. And then Quanergy has raised $90 million. Intel’s proposed $15.3 billion purchase of Mobileye is yet another example of hefty investments being made in automotive electronics, according to Cambou. So are autonomous vehicles approaching Gartner’s famous Peak of Inflated Expectations, before settling into the Trough of Disillusionment? So how disruptive is this technology? According to Yole, when looking at a disruption one has to check if it offers a new type of application, addresses untapped markets at the bottome of current ones, and whether those untapped markets are ignored by incumbents. Cambou also sees artificial intelligence as a key technology for autonomous vehicles. “Every processor manufacturer is looking at the task, and this is very much related to the vision sensors,” he says. What’s clear is that investment capital for this market isn’t hemmed in by geopolitical boundaries, despite the fact that bulk of the early development work in this market occurred in the United States. Hesai, a LiDAR startup first established in Silicon Valley in 2013 and which relocated to Shanghai, China, in 2014, has just raised $16 million in Series A funding led by Pagoda Investment Advisors of Beijing. Grains Valley Venture Capital, Jiangmen Venture Capital, and LightHouse Capital Management also participated in the funding round. Earlier this year, TetraVue of Vista, Calif., received $10 million in private funding from Robert Bosch Venture Capital, Nautilus Venture Partners, Samsung Catalyst Fund, and Hon Hai Precision Industries, the contract electronics manufacturer that does business as Foxconn Technology Group. The flash-based, solid-state LiDAR startup was established in 2008 and was previously supported by angel investors and almost $10 million in government grants. Blackmore Sensors and Analytics of Bozeman, Mont., has brought in a Series A round of $3.5 million for its frequency-modulated continuous-wave LiDAR technology, led by Next Frontier Capital and Millennium Technology Venture Partners. The company expects to offer prototype automotive and deployable surveillance systems by mid-2017. Blackmore also provided its HRS-3D-PS LiDAR to the U.S. Army under a two-year contract with the Rapid Innovation Fund. Berkeley-based Civil Maps, a LiDAR mapping startup that converts raw LiDAR data into live maps for autonomous vehicles, last year received $6.6 million in seed funding from Ford Motor, AME Cloud Ventures, Motus Ventures, StartX Stanford, and Wicklow Capital. TriLumina of Albuquerque, N.M., is a spinoff of Sandia National Laboratories and has received $9.2 million in funding from Caterpillar, Denso, and other investors for semiconductor-based lasers that can be used in LiDAR systems and other applications. It was founded in 2010 and is currently working with Analog Devices on development of a solid-state illuminator module for flash-based automotive LiDAR systems, using TriLumina’s vertical cavity surface emitting laser arrays. Baraja of Sydney, Australia, has pulled in a $1 million grant from the federal government of Australia to develop its LiDAR technology. It has also received financial backing from Blackbird Ventures. Innoviz Technologies of Kfar Saba, Israel, last year raised $9 million in Series A funding from Amiti Ventures, Delek Investments, Magma Venture Partners, Vertex Venture Capital, and Zohar Zisapel. The LiDAR sensor startup was founded by veterans of the Israeli Intelligence Corps. Israel is also home to Oryx Vision, which is developing coherent optical radar technology, touting that as an alternative to LiDAR. It involves a long-range infrared laser. The startup, founded in 2009 and located in Petah Tikva, has received Series A funding of $17 million from Bessemer Ventures, Maniv Mobility, and Trucks VC. It previously took in $300,000 from angel investors. First in a series: Challenges increase across the board, but for different reasons. Low profits temper investments. What’s Next In Neural Networking? Technology begins to twist in different directions and for different markets.